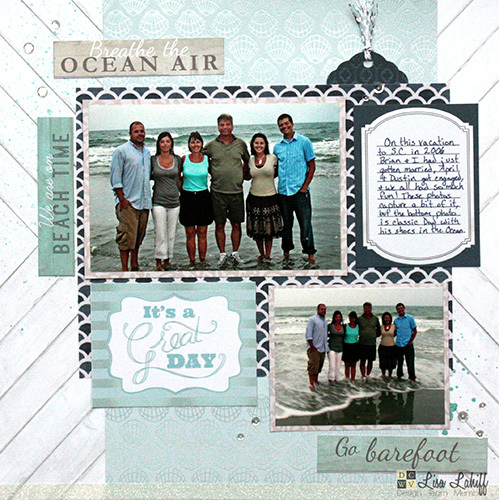 If you want a creative way to document a fun family vacation, check out this project! 1. Start with one 12” x 12” patterned paper and add Ink Mist splatters going diagonally across the page and set to dry. This will become the background for the layout. 2. Trim one sheet from the stack to 12” x 8” and adhere slightly to the right of the background page. 4. Trim two mats for your photos measuring: (1) 6 1/4” x 4 1/4” and (1) 4 1/4” x 3 1/2”. Adhere these to photos then adhere to layout. 5. Trim strips of sentiments from the paper, and adhere around the layout. 6. Trim a vertical journal box, write journaling then adhere next to larger photo. 7. Trim another sentiment card and adhere it to the side of the smaller photo. 8. Optional: Add a die cut tag from patterned paper and adhere behind the 9”x 7”, add sequins across the layout, and a strip of washi tape straight across the bottom of the layout. If you want to add a tag, check out our other tutorials of Mixed Media tags!